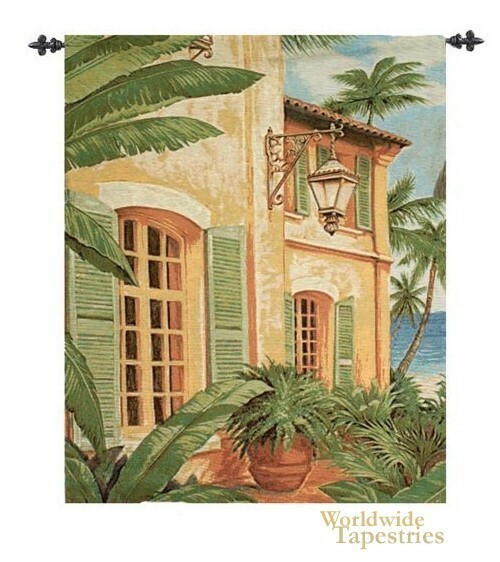 A relaxing tropical villa is seen here in this tapestry after the work of the Dina Art Company. The breezy setting is suggested by the palm trees and the ocean beyond. The location suggests an idyllic place for a holiday getaway. This cityscape tapestry "Tropical Villa" is backed with lining and a tunnel for easy hanging. Note: Rods and tassels, where pictured, are not included in the price.